A perfect time to spotlight author Lisbeth Coiman’s memoir, I Asked the Blue Heron. I was 16 when my mother chased me with a hammer. Q. Did you always know that this would be the beginning line of your book? A. No. I didn’t know that was the beginning of the book. When I started writing my story, my writing teacher at the time, Theo Pauline Nestor, suggested to start there, but I contradicted her and decided I didn’t want to make my book about my childhood experiences. Instead, I wanted to honor my friend for guiding me for most of my adult life. With that in mind I started the book with the moment I met Zoe Graves. It was the third time somebody pointed it out to me, so it was time to pay attention. It took a while to rewrite the first chapter, but I kept an eye on my schedule and worked night and day to do it. It changed the focus of the book completely, but I hope my story still honors my mentor and best friend. Q. How have you promoted I Asked the Blue Heron. A. I have found that book promotion is the hardest part of self-publishing. I still don’t have it under control. I network a lot, and I’m grateful to several reading series in Los Angeles for inviting me to read from my book. I have promoted online, through social media, and through my blog. I’m constantly speaking about “I Asked the Blue Heron” to anybody I meet. For that purpose I carry it in the trunk of my car. I will have more time this summer for book promotion, and plan to travel to a few cities in the US and Canada to promote my memoir. I have been lucky. People keep inviting me to events. This week, for instance, I will attend a meeting in Torrance, CA to tell my story and bring my memoir with me. In July, I will speak to the congregation of a Unitarian Church in Redondo Beach. Little by little, by word of mouth, one book at the time, I continue to sell it. Q. You’ve bravely shared your experience with mental illness. Can you give a few tips for others experiencing mental illness? A. Stay on top of symptoms. If I tell my doctor, “I’m fine,” and I look fine, the doctor doesn’t have any way to know I am spiraling down (or up). I can’t wait until I believe helicopters with cameras are chasing me on the street to get the doctor’s attention, say, on a psychotic episode. Those things don’t start full-blown. Subtle symptoms show up before a crisis, and if treated on time, I can prevent crisis. Catching my symptoms requires honesty and understanding of my condition. If I know that I have a tendency to become paranoid, and I feel that NPR is talking about me, I have to tell my doctor as soon as possible. I’ll require smaller doses of medication to treat mild symptoms than those required to treat a full-blown mental crisis. B. Work or volunteer. I have to do something that requires to wear clothes other than pajamas during the day, and get out of my house early in the morning. A well-earned pay check at the end of the month feels much better than medication, and doesn’t have side effects. When I couldn’t find a job because I didn’t have a specific certificate, I went back to school to get the certificate. When I wasn’t able to work because of my immigration status, I volunteered. I shelved books in my son’s school library, planted flowers in a public garden, gave water to runners in 5K events, or taught English As a Second Language free. I kept myself busy to change the focus of my thoughts. Human beings need to feel useful and appreciated. I suffer from a mental condition that makes me feel like crap, and if I don’t find a reason to get out of my bed, I feel worse. Apart from money, satisfaction, and a sense purpose, volunteer or paid job also provides me with a starting point to become part of a community. C. Structure. Structure helps me live through my days with a sense of normalcy. People who do not understand my condition may think I am fastidious, or compulsively organized. I’m neither, but I want to prevent crisis. I prepare the entire wardrobe to wear each day of the week on Sundays because I freak out and cry if I don’t know what to wear in a hurry (which looks like Monday morning for every other woman I know, only they don’t become paralyzed.) I do shopping lists even to buy underwear because I can’t decide and get frustrated. I take pictures of where I park my car and where I enter malls because I get lost and panic. I have a large planner and know exactly what I will do every hour of the day. If I don’t, I literally walk around in circles. I write to do lists every day. Most importantly, because I live alone, and I’m responsible for my life, I have a Safety Plan posted on the refrigerator door, above my bed, and above my desk. If I start considering to harm myself, I have a plan to safe myself from harm. Nobody is with me to watch over me. Still, there are things that are beyond my control, but I keep working on them. Self-destructive thoughts and unpredictable reactions when I am extremely frustrated continued to be a challenge for me. 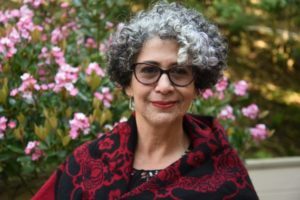 To reach Lisbeth Coiman to book an author event or to find out more about her story, you may find her here. 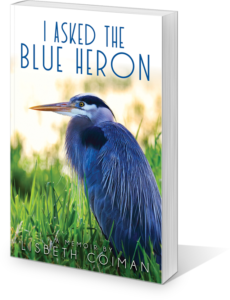 I Asked the Blue Heron is available here in both kindle and paperback.